The historic factory buildings of King West Village are now home to the creative forces behind the city’s leading art galleries, ad agencies and tech startups. Take in the sweeping views of the cityscape and Lake Ontario from the floor-to-ceiling windows of your room or the city’s only rooftop lounge with a 40-foot infinity swimming pool. 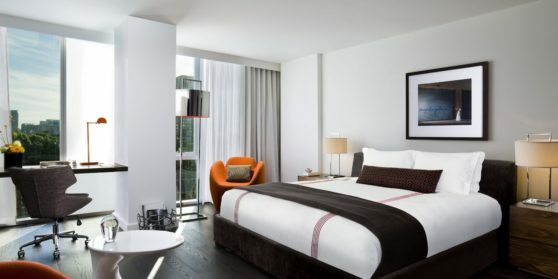 Designed by New York’s Studio Gaia, your room opens onto floor-to-ceiling windows with sweeping views of the T.O. skyline and Lake Ontario. Dark hardwood floors, contemporary furnishings and an open, airy atmosphere are punctuated with contrasting accents in lush orange and cool white. Even amid our Toronto neighborhood’s many hotspots, Thompson knows you may never feel the need to leave, with food and drink options to suit any mood: From our own contemporary classic diner to Toronto’s premier rooftop retreat—with poolside cabanas and cocktails. Located in the heart of city’s vibrant entertainment district, Thompson Toronto’s 30,000 square feet of prime Toronto event space—including our stunning Rooftop Lounge and a luxurious Screening Room—offers the ideal setting for conferences, meetings, private screenings, weddings, rehearsal dinners, showers, receptions, bar/bat mitzvahs and fundraising events. All rooms are equipped with state-of-the-art audio-visual technology. Convenient parking is accessible 24 hours in a secure underground facility, with valet parking available.